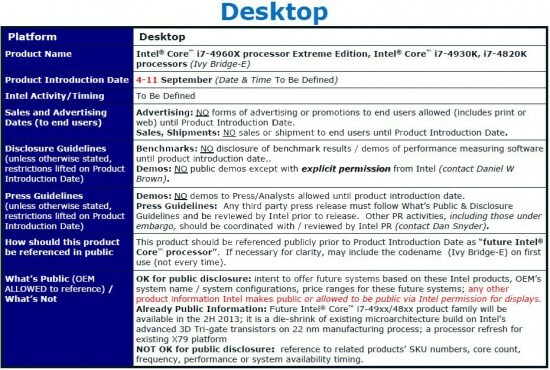 Dutch tech site Tweakers.net came across details of three of Intel's upcoming Ivy Bridge-E series processors. These new high-end Core i7 Extreme series processors are anticipated to arrive in the week of September 4-11, it will include the Core i7-4820K, i7-4930K and i7-4960X. The i7-4820K is a quad-core chip with a clockspeed of 3.7GHz, 3.9GHz Turbo and 10MB L3 cache memory. The other chips are six cores versions, the i7-4930K is clocked at 3.4GHz, with a 3.9GHz Turbo and 12MB L3 cache, while the 4960X is the new flagship with a 3.6GHz core, 4.0GHz Turbo and 15MB L3 cache. All three models have a TDP of 130W, they use a LGA2011 socket and are compatible with X79-based motherboards.